BD FACSuite software minimizes the number of user interactions with the instrument so that the user can spend more time working with samples. BD FACSuite software users can complete tasks at the click of a button for key workflows, from startup through instrument setup, sample acquisition, data analysis and system shutdown. BD FACSuite™ CS&T Research Beads are used to check the cytometer performance and automatically make adjustments, ensuring consistent values from day to day and experiment to experiment. Comprehensive checks during system initialization and setup, including performance QC, verify system performance, ensure that detector settings are optimal and triggers the automated laser alignment process if required. The entire setup process can be performed without manual intervention. Accurate compensation is absolutely necessary for proper analysis of multicolor flow cytometric experiments, but it has always been a challenging and time-consuming process for users. In the past, generating accurate compensation matrices typically required running individual compensation controls for every fluorochrome used at least once a day. Thus, for a five-color experiment, all five fluorochromes would be run initially to determine their spillover values (SOVs) for a compensation matrix. To subsequently add a sixth fluorochrome to the experiment, users would have to re-run all six at the same time. BD FACSuite software minimizes the frequency and number of compensation controls required by taking advantage of the accurate, reproducible instrument setup provided by a combination of BD FACSuite™ CS&T Research Beads and BD FACSuite™ FC Beads. A single 20-minute procedure using BD FACSuite FC Beads determines SOVs that are gain-independent. These values are valid for 30 days. To add a new fluorochrome to the system, users run just one control for the new fluorochrome. Finally, the calculation of gain-independent SOVs lets users modify photomultiplier tube voltages if required without re-running compensation controls. All SOVs are automatically recalculated. Together, these features mean time savings every day, since the BD FACSVerse™ system significantly reduces the frequency and complexity of the compensation process. It does this while increasing the accuracy and reproducibility of SOVs, and therefore the final experimental results. To increase laboratory efficiency and ensure the system is ready by a specified time each day, a timer in the software can be set to turn on the instrument and complete initialization and warmup routines. 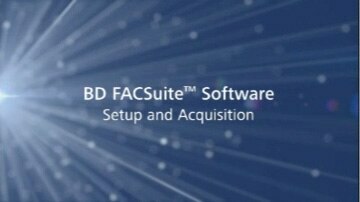 BD FACSuite software can also be programmed to shut down the BD FACSVerse system at the end of the worklist run or when the system is idle for a specified period of time. In the case of idle time shutdown, a dialog communicates that the system will be shutting down, so that users can cancel the shutdown if desired. A Forward scatter vs side scatter of CTN using BD FACSuite software. B Plot showing aggregates on the basis of Propidium Iodide width (W) vs Propidium Iodide Area (A). C Resolution and linearity shown by a Propidium Iodide - Area histogram of propidium iodide stained CTN.